This great little evergreen plant (well, in our area of Cheshire anyway), has the common name of New Zealand brass buttons, and only grows about an inch (2.5cm) high, and spreads about 18in (45cm) to create a mat of green leaves that become bronzed in winter. The brass buttons of the name refer to the tiny yellow button-like flowers, but these are hardly noticeable, being so tiny and on such short stems. Also, bees aren’t that interested, so no danger of them stinging as you walk across the lawn. It’s a great alternative to grass (no mowing!) in a place that isn’t walked on that much, other than to access the flower beds for a spot of weeding. It won’t stand a game of football or daily treading, but provides a lovely low maintenance patch of greenery for most of the year, becoming bronzed in winter. It is hardy down to -6 degrees C or even lower if you’re lucky. 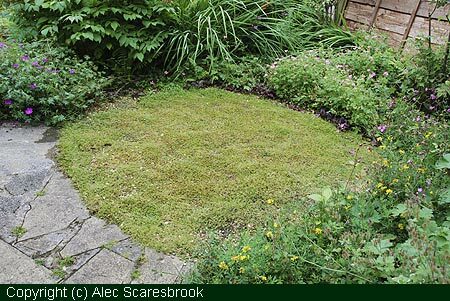 It prefers well-drained soil and spreads to fill in gaps quite quickly without being too invasive. It likes the semi-shady spot in our garden, and looks good most of the time, but does sulk during a heat wave. We created our ‘lawn’ by digging up some clumps of C. squalida that were already growing well in a flower bed, and splitting up the clumps to plant over the whole area, then covering it with garden fleece until rooted. This was to stop the young blackbirds pulling out the stems, which they mistake for worms. In the beginning it also needed a fair bit of hand weeding to remove opportunist growth of various things in the bare patches, but now it’s knitted together, this is less of a problem, except for creeping speedwell which was in the ground to start with and keeps popping up. 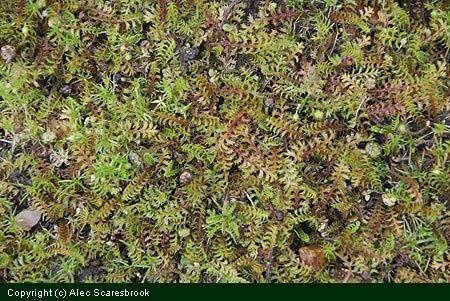 When searching for this plant, note that it may be listed as Cotula or Leptinella, and there are spelling variants – squalida or squallida. Also – don’t confuse New Zealand brass buttons with another brass buttons (Cotula corononopifolia), which is a short-lived semi-hardy wetland plant with more showy flowers and larger, taller leaves. Certainly not a suitable grass substitute. We bought our plants from a local nursery near Leek (Barncroft Nurseries – they don’t do mail order) but you could probably buy or order them from a specialist nursery exhibiting at one of the RHS shows (RHS shows). Growers tend to classify C. squallida as an alpine or rockery plant, or sometimes list it under groundcover. You could also try online such as from Beth Chatto Gardens, which is also open to visitors. Other nurseries sell the darker-leaved version, ‘Platt’s Black’, which is not really the colour for a lawn alternative – well, we don’t think so.